Blog Where do Antique Cobblestones come from? 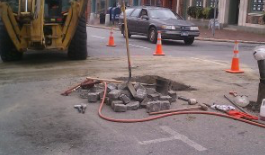 I knew I might have one of those mornings when I approached my office and I saw the National Grid (our electric and gas company) truck parked out in front of my office and one of the workers was unloading a hackhammer. My office overlooks the street from the second floor. Well, after enduring a less than tranquil morning I left my office for lunch and saw this scene and snapped this picture. Many of the cobbles we harvest come from when streets are redone and reclaimed cobblestones are “discovered”, just like these guys found. I can not imagine how many cobbles have been paved over and are just waiting to be found! If you are looking for a unique and antique material for your next project give us a call. We probably can put our hands on some for you. For more information visit us at www.stonefarmliving.com or give us a call at 203.270.2900.